Edited ByPatrick E. Murphy, John F. Sherry Jr.
Marketing is among the most powerful cultural forces at work in the contemporary world, affecting not merely consumer behaviour, but almost every aspect of human behaviour. While the potential for marketing both to promote and threaten societal well-being has been a perennial focus of inquiry, the current global intellectual and political climate has lent this topic extra gravitas. Through original research and scholarship from the influential Mendoza School of Business, this book looks at marketing’s ramifications far beyond simple economic exchange. 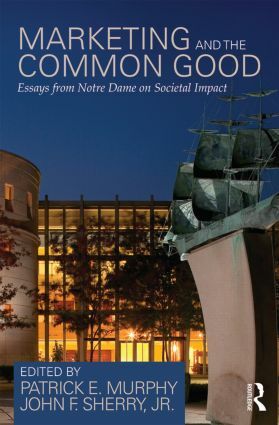 It addresses four major topic areas: societal aspects of marketing and consumption; the social and ethical thought; sustainability; and public policy issues, in order to explore the wider relationship of marketing within the ethical and moral economy and its implications for the common good. By bringing together the wide-ranging and interdisciplinary contributions, it provides a uniquely comprehensive and challenging exploration of some of the most pressing themes for business and society today.